Ramdeep Singh Goldy prisoned since 2013 in Nabha jailed, Panjab have been acquitted by a Patiala court from Aariya Samaj bomb blast case. 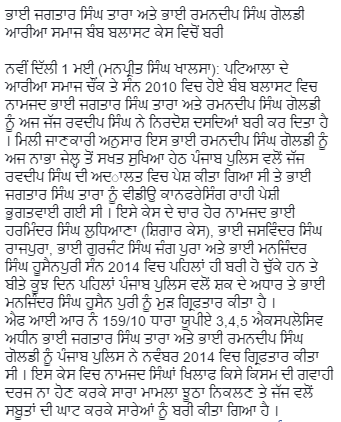 Ramandeep Singh Goldy now have only one more case pending against him. Sikh Relief have been supporting Bhai Ramandeep Singh throughout his prison ordeal and will continue to support him and his family till his release. PATIALA, Punjab—The Additional Sessions Court of Patiala on May 1 acquitted Bhai Jagtar Singh Tara and Bhai Ramandeep Singh Goldy in seven years old bomb blast case. Notably, a low intensity bomb blast near the Satyanarayan Mandir (Arya Samaj) in Patiala had left seven injured on April 10, 2010. Additional Session Judge Ravdeep Singh absolved Bhai Ramandeep Singh Goldy and Bhai Jagtar Singh Tara of all charges as the Police failed to present any evidence to back their claims against these political Sikh prisoners. Speaking with Sikh24, Advocate Barjinder Singh Sodhi informed that Bhai Goldy’s name was not mentioned in the original FIR instead his name added later. He informed that Bhai Jagtar Singh Tara attended the Court hearing via video conferencing while Bhai Ramandeep Singh Goldy was produced before the Court by the Police. It is pertinent to note here that the Khanna police had earlier framed Harminder Singh (Ludhiana), Jaswinder Singh (Rajpura), Gurjant Singh (Zirakpur) and Manjinder Singh (Hussainpur) in this case under sections 3,4,5 of Explosives Act but the Court had acquitted the quartet. Previous post Beadbi (Sacrilege) of Guru Granth Sahib | Historical Gurdwara Sahib of Guru Gobind Singh Ji | Village Lamma Jatpura, Situated Near Jagraon.